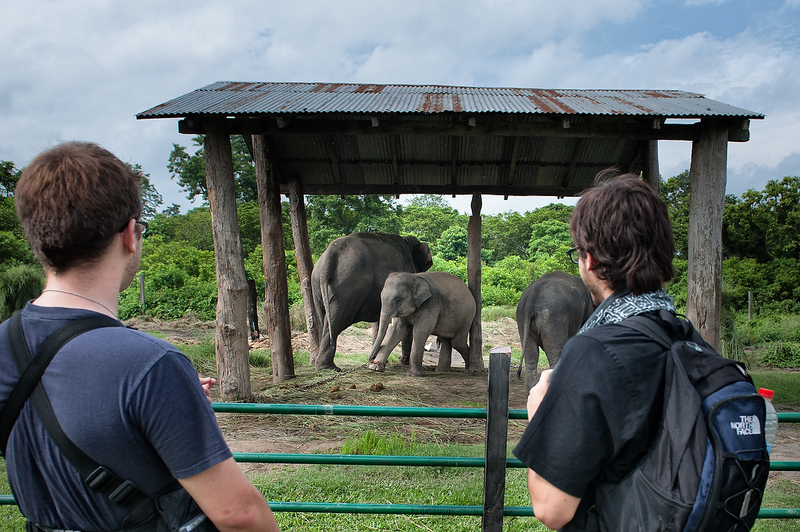 Two american tourists watch elephants at the elephant stable in Chitwan. A baby elephant born at the center nurses at first and is gradually weaned to an elephant's natural diet. At age three it is corralled for a period of seven days with other babies to wean it from dependence on it's mother. It is then introduced to its two mahouts and all three begin an arduous seven year training period. Mahouts control elephants by three methods; commands given by voice, those given using an elephant prod, a stick ending in a blunt hook, and by applying pressure with the feet and legs. The prod might be to tap parts of the animal's body to indicate the angle of work, the desired direction to move indicated with the feet, and the action begun with a voice command.